Dan Dillon, Ben Glass-Siegel, Nate Vandiver, and I stood at the edge of a Baltimore road. Cars whizzed by overhead as Glass-Siegel and Vandiver picked their way through dense grass to the river running swiftly beneath the bridge, the blades swishing against their long pants as they blazed a path to the rocky shoreline. I like to think of Dr. Neil Pederson as a detective. We met in his office at the Harvard Forest Long Term Ecological Research site (HFR-LTER), on the second floor of one of their many beautiful buildings in what feels like a college campus. 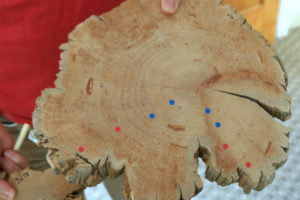 Multiple sections of tree trunks sit here and there, polished so that the tree rings are clearly visible. Post-it notes and circular stickers mark years of particular interest. 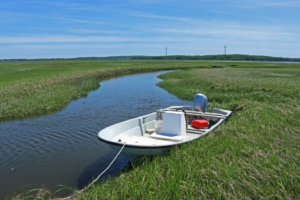 Students gathered at a saltmarsh site in Massachusetts, taking a break from their regular school day routine to remove invasive perennial pepperweed plants from among the bushes and marsh grasses. 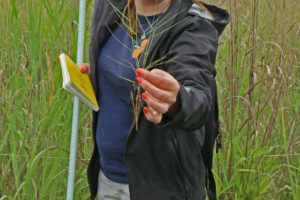 Part of a suite of programs and teacher workshops aimed at educating local students and adults about marsh ecosystems, this field trip pairs ecological research with real restoration projects. We stopped at the edge of the river, and Kelsey hopped out with a water quality data sensor to take readings of salinity, temperature, oxygen. Brown water churned around him as he walked slowly across the muddy bottom, silt billowing in the creek channel like clouds of smoke. 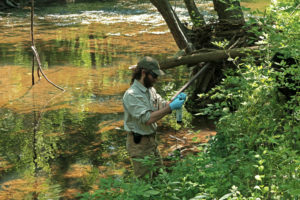 The data logger is part of a network of such sensors, each taking readings from different parts of the marsh ecosystem. Kelsey piloted the boat up a smaller creek, stopping in front of a wooden-plank boardwalk leading to a tall eddy covariance flux tower. 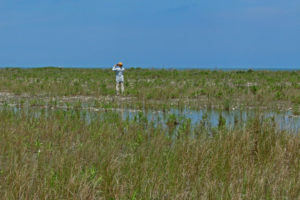 The tower comprises a series of instruments that take regular measurements that provide a comprehensive picture of carbon dioxide exchange, evaporation, and energy exchange in the coastal marsh. 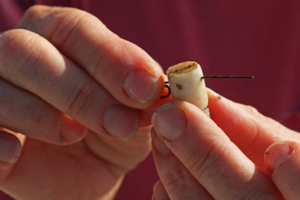 Put simply, the flux towers record the very breathing of the marsh ecosystem. Parking under a bridge, I walked down a short dirt road to the cutgrass (Zizaniopsis miliacea) marsh. The bright green stalks waved overhead, completely immersing me as I stepped onto a narrow boardwalk that provides access to the gridded plots. 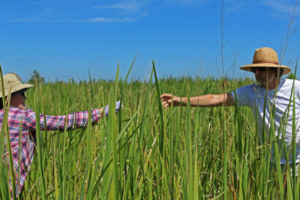 The air was hot and humid, t-shirts and shorts sticking to arms and legs as students and researchers moved amid the marsh. 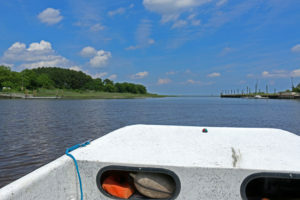 Every month, Field Technician Tim Montgomery loads his equipment onto a center console motorboat and heads off into the marshes surrounding Sapelo Island, Georgia. 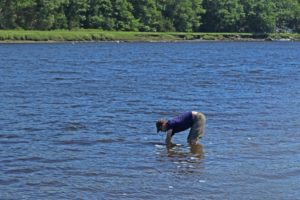 Over the course of several hours, he stops at multiple sites to check on the Georgia Coastal Ecosystem LTER network of data loggers continually collecting water quality parameters as they gently bob in the water. On one particular morning, I had the opportunity to go with him.